We are continuing on the journey of simplifying our lives. We have talked about What Stress Does to Your Body and natural methods of lowering the effects of stress on the body. We’ve also discussed simplifying breakfast, Meal Planning, and organizing the Kitchen. 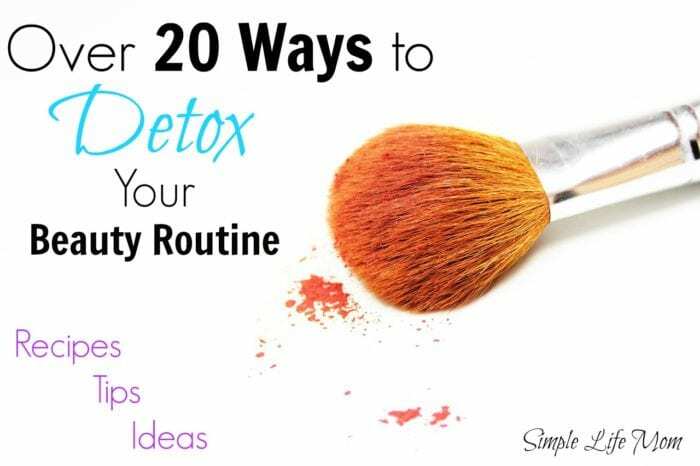 Knowing Over 20 Ways to Detox Your Beauty Routine can be a very big step for most people, women and men included. 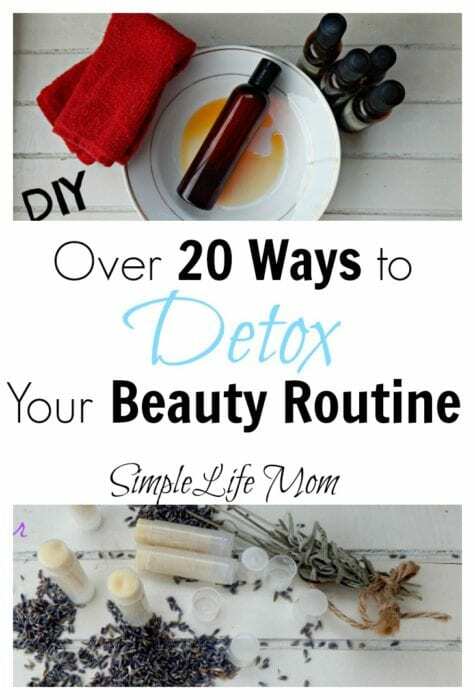 Even if you don’t wear much or any make up at all, your morning and evening routines should be examined if you truly want to remove all toxins from your routines and lead and healthier and longer life. And who doesn’t want that? I have some affiliate links, links to recipes, and links to my shop below, all in an effort to give you easy options to help you along the right track. We are trained in America to choose products based on packaging design and a few key large phrases written on the package. Otherwise, why would Kraft add food coloring to its products in America, but not in other countries. Their studies have found that we, for the most part, choose with our eyes, not our brains. I believe this lack of scrutiny on our part has led to an acceptance of mass production methods and the use of toxic materials to appease our eyes or give us an immediate, but not lasting result (especially when it comes to our beauty products). Now, we can’t be too hard on ourselves. After all, the amount of money behind keeping us ignorant is in the billions. Just follow the lobbying behind cases to keep information off of labels. Why would these large companies spend millions each in order to support ignorance of their actions? I think it’s obvious. Instead, we are bought with new phrases such as “Cage Free” on eggs that are kept in just as horrible barn conditions with no sunlight and healthy food. Or we are told the chickens are “Vegetarian Fed” in response to people’s concern for them being fed animal byproducts, when instead they are fed an all GMO corn diet instead of being able to forage for bugs. The cosmetic industry has very little regulation on ingredients. Out of the thousands of ingredients used, only 11 are regulated. 1 As long as they list them, they can put anything else as long as it’s not considered poisonous. But what IS considered poisonous by the FDA? Apparently, very little! – which seems to be demonstrated by the cancer rate in America right now. We really have to do a lot of research on EACH ingredient on cosmetics in order to know if it could possibly be toxic to our bodies – even if the effects are not immediate! 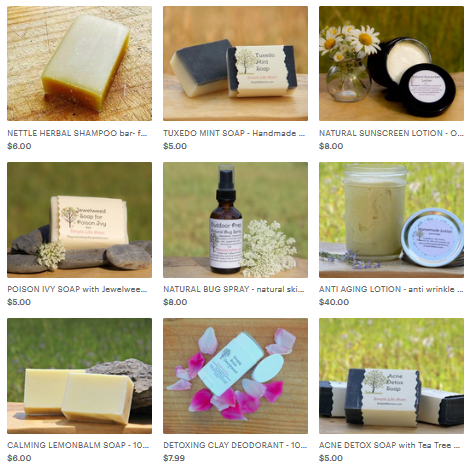 One easy way is to use EWG.org to check your favorite products. You can also learn a little about their ingredients there as well. I’m starting with clothes, because it’s something people don’t often consider. We could get into the actual production and manufacturing of the cloth you put on your body, but I’m not even going there. An easy way to cut out some harsh ingredients that your skin must deal with is to use a Natural Clothes Soap. There are very few clothes washing detergents in the store that are not full of ingredients that are unhealthy for our bodies. Because we do not take them internally, those ingredients are allowed. Don’t forget that your skin is the largest organ on your body and you DO have to deal with those ingredients. Shampoo – Do you use a shampoo? They often have toxic parabens, fragrances, octinoxate, ethylhexyl, and so on. You’re putting that stuff on your brain…literally!! Instead, try some herbal rinses, or a natural shampoo bar. Conditioner – Conditioners are often just as toxic as shampoos. A great alternative is to just use a 50/50 mixture of apple cider vinegar and water. I have mine in a spray bottle in my shower. Just spray and rinse for a great hair conditioner that neutralizes the ph of hair after being washed. Detangler – I have had the child with tight curls and knots that you think you need to just cut out instead of brush. Yet, we never used detanglers! I haven’t found one yet that wasn’t highly toxic. Developing a brushing routine is the most important so that it doesn’t become unmanageable. I have a daughter that I thought did headstands at night though. Her hair would have the worst knots. We were able to use a simple recipe to fix it. Click here to get it. Hair Gel – Hair gels can be full of parabens as well (there are many kinds and they are all a 7 on the 1-10 scale of toxicity). That is not something that I want to be putting on my child’s hair. You can Make Your Own with this recipe, or buy some that are considered healthy, like this one. Hair Spray – I used to think that hair spray was a complete loss, that there was nothing out there that was safe to use, but there are a number of products that have great ingredients. They may not be in a high pressure aresol can, but you can still spray and get a similar result. Here’s one brand to get you going. Moisturizer – What’s your favorite moisturizer? What does it have in it? If you’re not sure then you could be spreading on a thin layer of poison onto your skin daily. You can Make Your Own or Find Some HERE. I also have Body Shimmer Lotion Ideas. Acne Treatments – This is a hard one, because I know people can be embarrassed, teens can be harassed, and it can also be painful and uncomfortable. What’s great is that some products like Neutragena On the Spot Treatment and Clean and Clear Persa Gel have ingredients that are considered harmless. Sunscreen – There is a reason that a large percentage of the population breaks out with sunscreen. Most have ingredients that have been proven by multiple studies to be toxic, as well as cancerous, and yet people still buy them in-mass. There are great options that really work! I have 4 Natural Sunscreen Recipes that you can try, Find Some HERE. Deodorant – Aluminum buildup in the body from use of anti-antiperspirants can cause oxidation of brain cells and anemia. Some studies have suggested a connection between Alzheimer and Parkinson’s Disease and aluminum toxicity due to the amounts found in the brain of those who died from those diseases. Aluminum toxicity once caused my lymph nodes to swell to painful levels! Merely changing my deodorant caused them to return to normal size. I would MUCH rather stink than use an anti-antiperspirant, but what’s great is that you don’t have to. You can use some healthy Brands like Toms of Maine and Crystal Deodorant. OR, you can make your own. I do, and I love it! It really works, is easy, and frugal. Nail polish can be found without the “Big 5” (Dibutyl Phthalate (DBP), Formaldehyde, Methylene Glycol/Formalin, Toluene, Tosylamide/TSFR). If not having those ingredients is advertised in mainstream products, then you know the 5 are deadly! This doesn’t even cover other ingredients that are estrogen disruptors. Basically, glues and a lot of plastics have been found to disrupt hormone receptors, causing imbalances. Placing these on nails instead of skin is better, but still highly questionable. Nail Polish Remover – A number of Non-Actetone polish removers can be found, and are definitely the better option. Others have various chemicals that have been shown to be cancerous. Some of the brands listed above also have some great options. I could talk about various ingredients here, but since you’re reading this, I think you already have a good idea and are looking for options. I’ve linked articles below that talk about dangers, as well as give you some great recipes to make on your own. I wish more women would understand that you can keep yourself clean and well kept and be beautifully natural. Natural does NOT mean dirty or grungy!! It means that you are clean, healthy, and confident in the beauty that you were born with. You are beautiful! Consider cutting back on the amount of hair products and makeup that you use; minimizing your exposure to toxins. I tried to make this a major resource page. You can find more on my Natural Beauty Archive Page. I hope this helps you along your journey toward a more simple and healthy life. Stay Healthy! 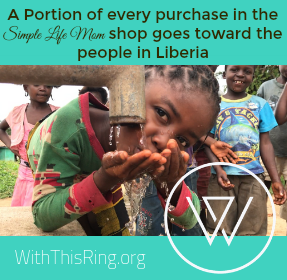 This post is part of the Simplify Your Life Series. See below for more great articles to reduce stress and simplify your life. I don’t use a lot of cosmetics and I make sure the little that I do use doesn’t contain harmful chemicals. Natural is the best. Great post. Have a terrific day! You are definitely a step ahead with staying healthy then. Great work! Great article! I love all the options! I’m following all these tips for many years now – I think it’s so important to reduce as many chemicals as possible in your environment. Wonderful! I feel like this is one area I can accomplish more easily than others. Thank you for sharing Stephanie! I have been switching everything possible to an organic DIY product. I cannot stand the thought of putting toxic chemicals on or into my body. Makeup is a huge thing for me to work at transitioning. The products I currently use work great, and have been almost impossible to replace. 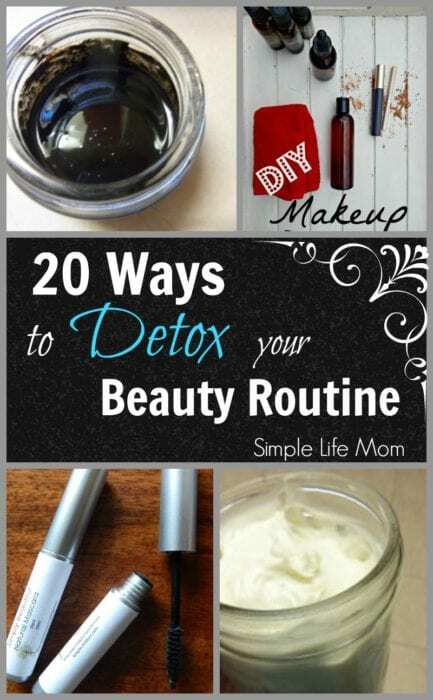 I love the thought of DIY cosmetics, so thank you for sharing these links! Also, thank you for sharing at the Let’s Get Real Link Party! Love this post that you shared on Let’s Get Real last week. I will be featuring this post on my site for today’s link up. Thanks so much for linking with us. Toxins are the reason behind illness and diseases. It’s so important to cleanse your body as much as you can. I LOVE this post. Thanks! Hi Kelly…thank you for sharing this post. It has proved to be an eye-opener to me. Now, I would be scrutinizing the products that I use on my body more closely. The links and the how-to’s you have shared are also pretty useful since they are easy. I shall get back to you with the results as soon as I try them out. Thanks again!